Google is announcing this morning that YouTube creators can now link their videos to projects on Kickstarter and Indiegogo. The company says that these crowd-sourced fundraising platforms were already being used by many YouTube creators, so it wanted to make it easier for those folks to connect their YouTube viewers to their project’s page. 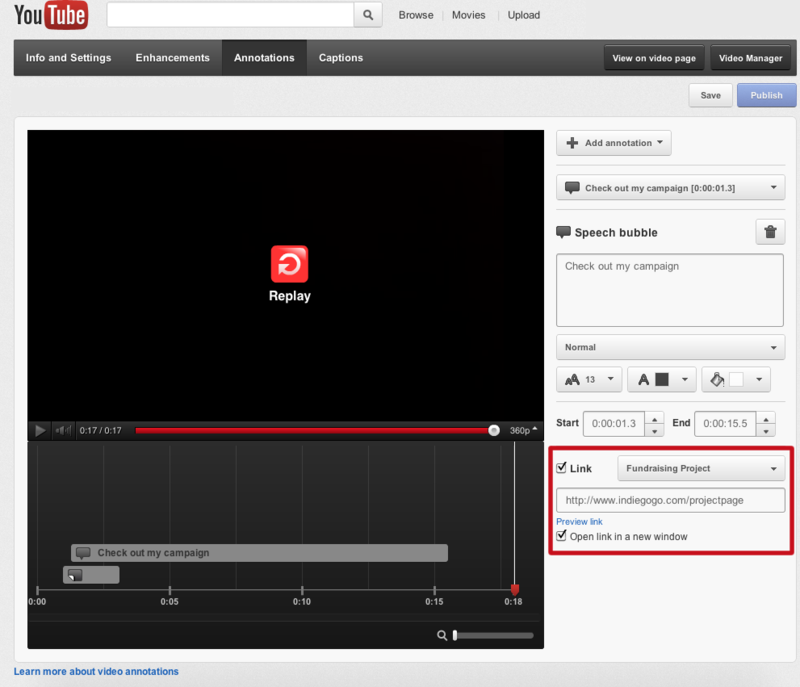 The new links will be supported by YouTube’s annotations feature, says Google. Annotations, for those unfamiliar, can be added to videos using a special tool that lets a video’s creator layer in text, hotspots, or links over their videos. These pop-up notes can then be seen when playing the video on YouTube or wherever else it may be embedded on the web. However, the feature is not supported on mobile devices or in the customized “chromeless” players. Google says it was inspired to add the new feature after seeing creators get their projects funded through the crowdfunding platforms, citing efforts like Freddie Wong’s Video Game High School and James Rolfe’s Angry Video Game Nerd: The Movie, specifically. To use the new feature, creators should go to the Video Manager, then click “Edit” and select “Annotations” to get started. On the screen that appears, check link and choose “Fundraising Project” from the drop-down, posting in the appropriate link below. You can see the option live now in a couple of videos, for example here and here. YouTube also highlights some projects on its Kickstarter page here. When viewers click the new “donate” buttons, a new tab opens taking you to project’s page, as opposed to redirecting you away from YouTube itself. Kickstarter, especially, has been surging in popularity, having recently hosted a number of record-breaking projects, including some that have brought in millions of dollars each. The projects are increasingly seeing mainstream media coverage, such as with the latest Kickstarter breakout hit, the Pebble Smart Watch, now up to over $3 million in funding after only asking for $100,000.